• Simulated leather cover with comb bound photo pages. • Select either 4'' x 5'' or 4'' x 6'' with Gold foil covers. 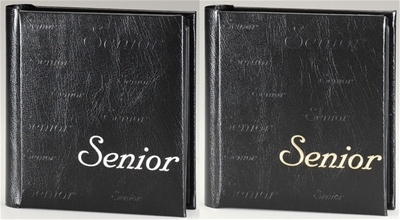 Simulated leather black covers have ''SENIOR'' embossed on the cover. Each Parade Commencement book has 10 comb bound pages for 20 photos front-and-back. Select either 4'' x 5'' or 4'' x 6'' with Gold foil covers.